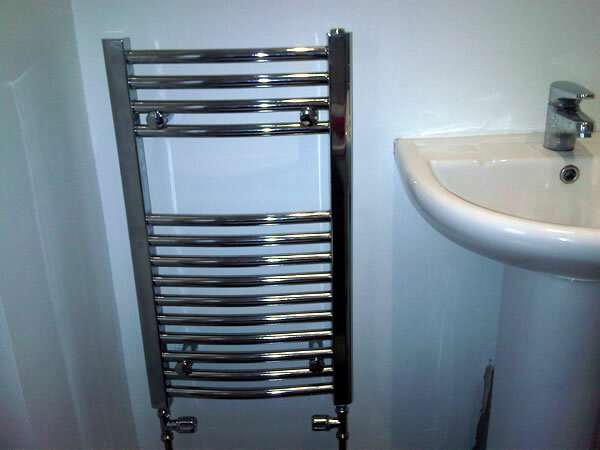 A new chrome towel rail, with chrome pipe work and valves installed above a bath. 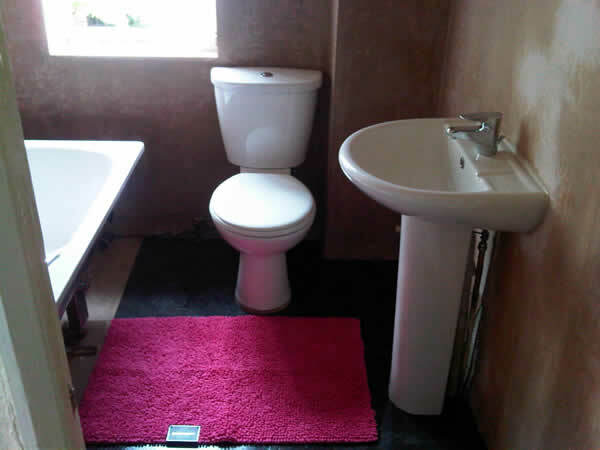 A great transformation to a Sutton bathroom. 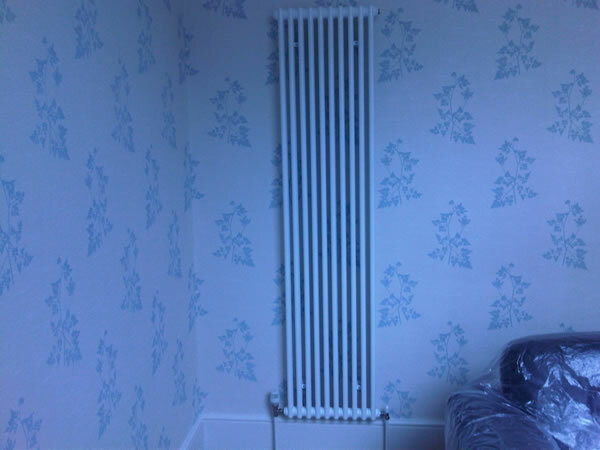 A designer column radiator with an identical radiator mirrored on the wall opposite. An easy way to modernise the look of a room & increase the heat output plus looks perfect in an old Tadworth Victorian house. 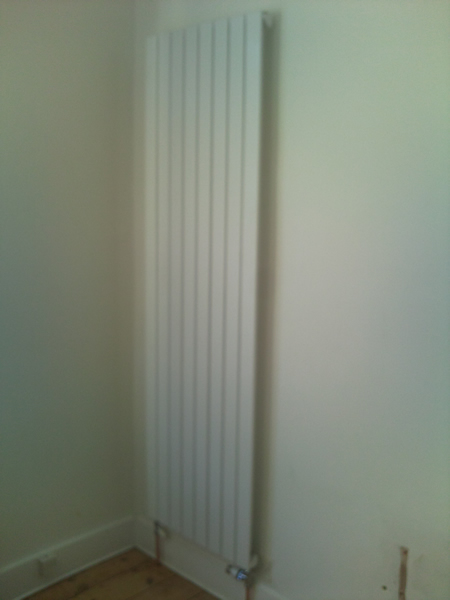 Very stylish, modern, flat panel column radiator made by Myson, installed in a house in Clapham. 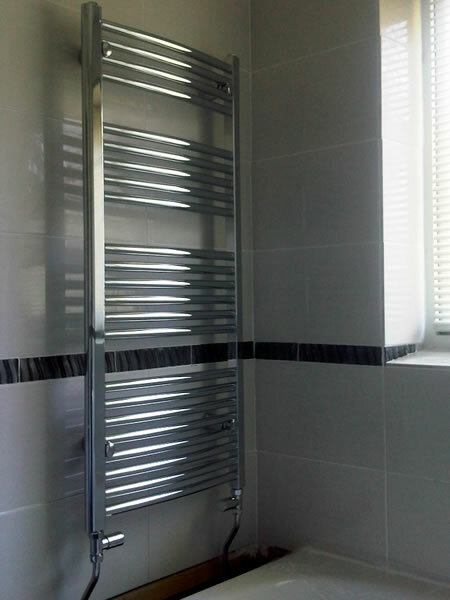 Back in December 2011 we fitted a boiler and bathroom suite for a customer in Morden, Surrey. 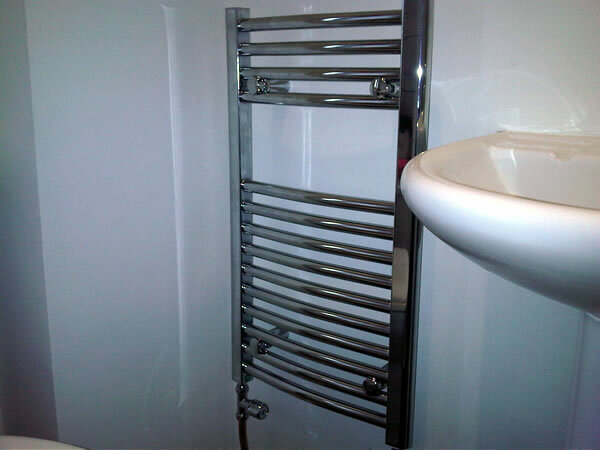 The customer then called us back for additional work and a new chrome towel rail to finish off the look in the bathroom. A very happy customer and we have already had recommendations from them. After installing a gas hob for a CheckaTrade customer in Sutton/Carshalton area they then asked for a quote for a new central heating system as they were relying on electric storage heaters in almost every room and an immersion heater for the means of hot water, so as you can imagine it can’t have been cheap. Whilst surveying the property we noticed a curved bay window in the dining room and thought it would be a fantastic opportunity for a curved radiator. 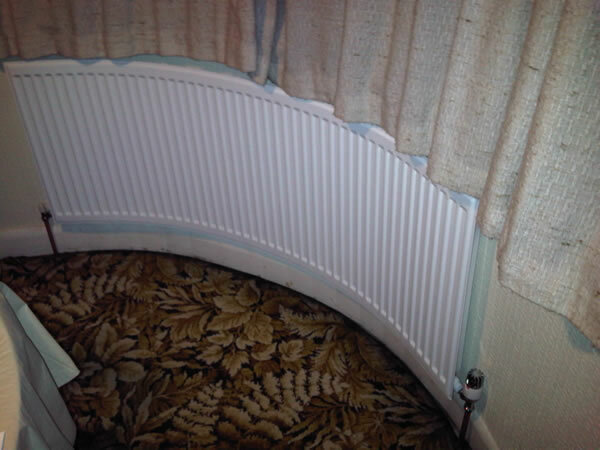 We made the extra effort and made a template of the curve in the bay and found a local specialist in Kingston to bend the radiator. Corrosion in heating systems can cause major inconvenience, especially when radiators decide to leak on your new carpet or wood flooring. we provide full system Power flushes using the state of the art Kamco CF90 Clearflow machine that can really help these situations and increase the life of your boiler & system. 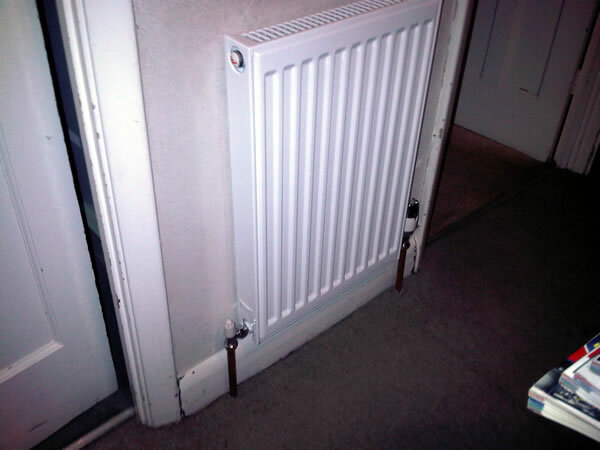 Whilst we are on the subject of leaking radiators, we got called to a job of two leaking radiators in Surbiton. 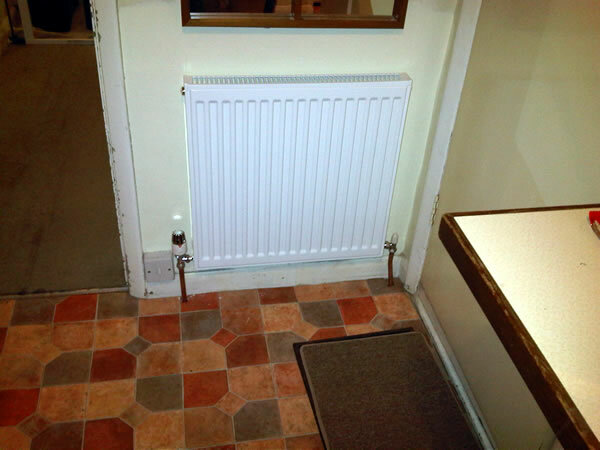 We priced up the radiators/materials required & fitted two very efficient radiators with an attractive top grill detail and thermostatic valves with new pipe work. Sit down in comfort whilst you take off your boots after coming in from a cold winters walk. Well this is what we did for a regular customer of ours in Kingswood. 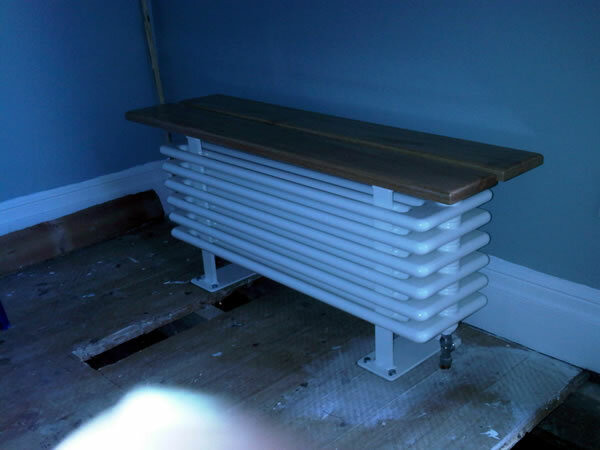 Being a period style house they wanted to keep things looking traditional so we installed this fantastic looking bench style radiator.